Oops, weekend science fun seems to be getting later and later. This week’s topic is, well, timely. A few years ago my son asked how long tree leaves live. Having grown up in the north, I always thought leaves lived from spring to fall. 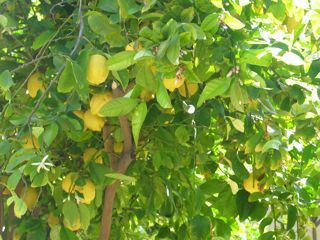 But here in Arizona, we do have trees that are green year around and I had no idea how long the leaves of a lemon tree, for example, might live. Then I began to wonder if trees and shrubs grow new leaves throughout the spring and summer, or whether they have short burst where all the leaves come out and that’s it. If you’d like to find out how long your tree or shrub’s leaves live, choose some freshly emerged leaves throughout the tree and mark them with acrylic marker. You can tell the young leaves because they are a lighter, brighter green color and are toward the tip of the branch. You could also mark the leaves with tags or ties, anything that won’t wear or fall off or interfere with normal leaf development and photosynthesis. Record how many leaves you tag, when you tag them and roughly where they are in the tree. Check your leaves periodically. You might want to mark more leaves each time if you see new ones. This is a long-term project, so be patient. We marked some of the new leaves on our lemon tree a few years ago. Our marked leaves remained on the tree through one entire year. The tree dropped a lot of leaves a couple of times, but our marked ones held on. Unfortunately our marked leaves were lost before the experiment was finished when someone trimmed the tree. We are going to try again this year. Let us know what kind of tree or shrub you choose and how long the leaves last. Let me know if you think we should do a contest for the oldest leaf. How long do you think it would take? The Live Oaks here in the south keep their leaves throughout the winter, losing them in the spring when the new leaves bud out. It seems quite bizarre to see leaves dropping like it is autumn when it's spring! That does seem odd. Do they drop them all or just the oldest ones? I don't know! I don't think they drop them all, as it doesn't seem like that many leaves on the ground. But they are small leaves and the wind blows, so possibly they just blow away as they fall and so you don't see them all. Don't think I can tag them all to see how many fall in the spring!